There's a Newf in My Soup! : Wishing Yule All a Happy New Year! Wishing Yule All a Happy New Year! It's beginning to feel a lot like Christmas...the day after. The temperature on our morning walk was 46 degrees! That's pretty nippy for these parts, and it may get even colder. The National Weather Service reported San Diego may experience a very cold weather system next week, with a mix of rain and snow levels down to as low as 2000 feet. I would love to take Trapper up to our local mountains for a romp in the snow! I had a quiet Christmas Eve and Christmas Day here in Coronado with family, but I was able to fly up to Northern CA this past weekend and spend some holiday time with TN at his parents' house - yes, my TN man is a CA boy. Our flights landed about the same time Friday night and we spent the next three days hanging out, visiting with his parents and a few friends, watching football (including my Chargers beating his 49ers! ), driving around seeing where he grew up, and cooking dinners together. TN was head chef for Saturday night's filet mignon, twice baked potatoes, and roasted asparagus, and he was my sous for Sunday's lasagna, Caeser salad, and garlic bread. I packed fresh lasagna sheets from Assenti's Pasta in my bag, along with homemade cookies and fudge (see below), and a Christmas stocking filled with various San Diego treats and favorites reminiscent of memories during our first year...a Coronado golf cap in SF Giants colors (his other team), taffy from Fuzziwig's in Coronado, Just Chili California hot sauce (I introduced him to Brigantine's fish tacos this year), Jerky's Gourmet jerky in craft beer and chipotle tequila flavors, Eclipse artisan chocolate bars in sea salt nib and peanut butter toffee flavors, whisky-infused salumi, David sunflower seeds in Ranch flavor, Sports Illustrated issue featuring Sportsman of the Year Madison Bumgarner, and a few other treats. TN has been adding charms to the charm bracelet he gave me a year ago that represent a little bit of him, a little bit of me, and some of the things we've shared. For Christmas, he gave me dog bone and Chargers' helmet charms...not that I'm a diehard Chargers' fan, but we were able to go to a San Diego home game together this season. I spent most of Christmas Day preparing dinner and dessert for the evening. I jumped on board for the latest Tuesdays with Dorie (Baking Chez Moi) Gingerbread Büche de Noël. We were permitted to post late if we chose to make this for Christmas. I've always wanted to make one of these Yule logs, but some of the more elaborate ones are quite intimidating. Dorie's variation involves quite a few steps, which took me most of the morning, but it wasn't difficult. Her version also omits cutting off one end and setting it atop the cake, to resemble a chopped off branch, and the little meringue mushrooms. However, the gingerbread sponge cake, with cinnamon, ginger, and brown sugar, didn't taste a whole lot like gingerbread to us, and it was a bit dry. 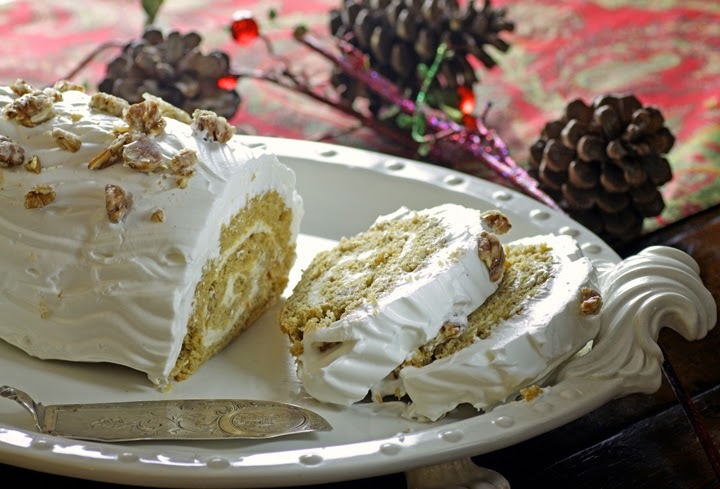 The cream cheese filling didn't impress me either - whipped cream cheese, butter, and chopped praline. My favorite part of this Büche de Noël was the snowy-white, meringue-marshmallow frosting. I used a cake decorating frosting tool in an attempt to make the frosting resemble the texture of a log. I'm happy I made this for Christmas, because it does make a beautiful presentation and I can say I've made a Yule log. Next time, I won't be so shy about trying a more traditional and elaborate version. The recipe for Gingerbread Büche de Noël can be found on NPR, here, or on page 86 of Baking Chez Moi. 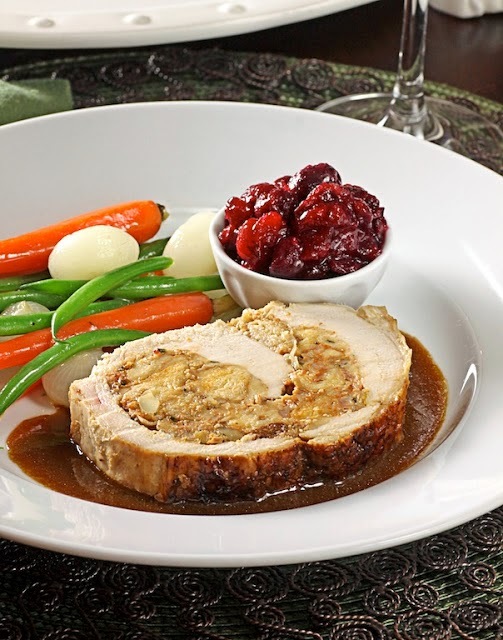 I didn't realize, until after dinner, that my entrée, Sylvie's Turkey Breast Ballotine, and my dessert complemented each other quite nicely (both French roulades - one savory and one sweet). This photo was taken when I made this the first time for Thanksgiving in 2011. Last night, I added mashed potatoes to soak up the amazing apple cider gravy. You can find the recipe on my blog, here. Since I didn't get around to doing a blog post on my fudge, I'll include it here. 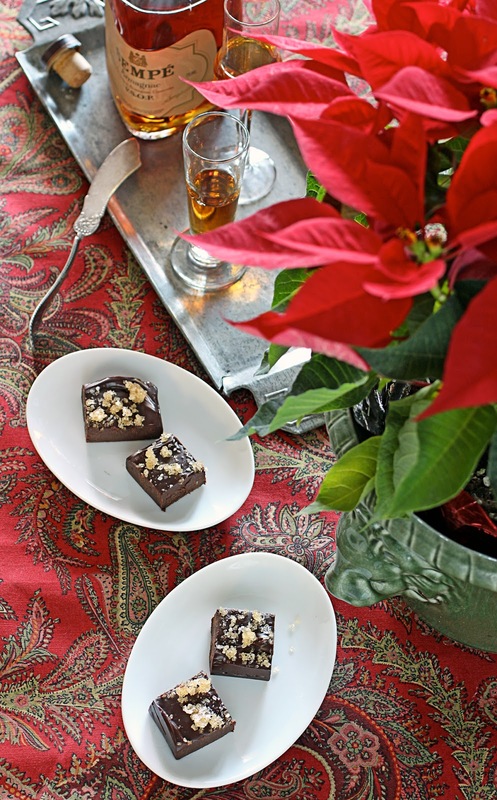 This dark chocolate fudge took a fraction of the time to make in comparison to the Büche de Noël, and was more up my alley with its crunchy bourbon sugar topping. I used Armagnac in place of bourbon, because that's what I had in the house. 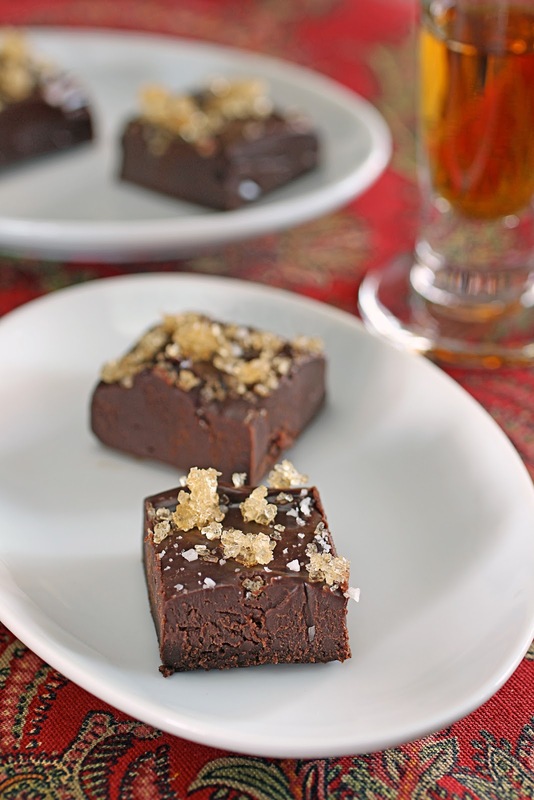 The recipe for Bon Appetit's Chocolate Fudge with Bourbon Sugar can be found here. It's time to go enjoy my Friday off...maybe a nice long walk on the beach. I hope everyone is enjoying their holidays, and Trapper and I wish you a very Happy New Year! Beautiful pictures of your food. And the slice of cake looks great! A splendid holiday dinner - presentation and photos top notch as usual! Happy New Year! Beautiful photos! I agree with you about your favorite part of the Bûche----the lovely, billowy frosting was amazing. I had some leftover and put it in hot chocolate! 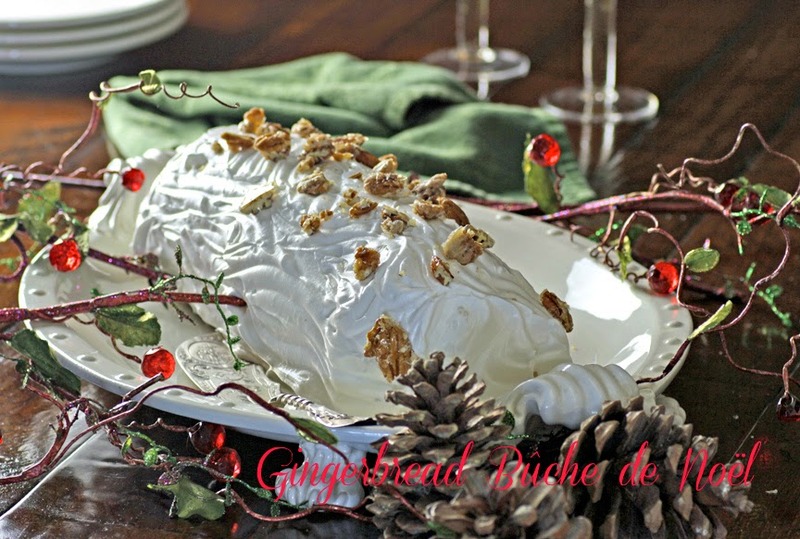 I like the roulade theme for your holiday dinner. Both look spectacular, Denise. Gorgeous cake! Sorry it wasn't a hit for you - I think it went over well here because it didn't taste of gingerbread! Ooh, that fudge looks amazing. The cake presentation looks pretty fab too.